Do you operate a Canadian small business? If so, you'll need to file a business income tax return each year. This guide presents all the information you need to know about preparing and filing Canadian income tax, from which business expenses qualify as legitimate Canadian income tax deductions through details on completing the T1 Personal and T2 Corporate Income Tax Returns. Which Canadian Income Tax Return Do You Need for Your Small Business? The tax return you need to complete and file for your small business depends on how your business is structured. If your business is a sole proprietorship or partnership, you report your business income on your T1 personal income tax form. Your small business is you, so to speak, and the T1 income tax return package includes Form T2125 (Statement of Business or Professional Activities), which you will use to report your business income. What Business Expenses Are Legitimate Canadian Income Tax Deductions? Before you sit down to complete your Canadian income tax return or take your tax return and all your relevant forms and documents to your accountant, it's helpful to know which business expenses qualify as Canadian income tax deductions and which don't. Maximize Your Business Income Tax Deductions - This first installment of getting ready to file your Canadian income tax covers keeping track of your receipts, income tax deductions related to the cost of doing business and income tax deductions for home-based businesses. More Ways to Maximize Your Business Income Tax Deductions – Learn the rules for vehicle business expenses, travel-related expenses, employing your child or spouse, advertising expenses and the kind of business expenses that fall into the Canada Revenue Agency's 'other' category. The Canadian Business Expenses Index provides a quick way to find out if a particular business expense qualifies as a legitimate Canadian income tax deduction and what the rules are for claiming that particular business expense. Home Maintenance & Home Ownership Income Tax Deductions – Being a home-based business owner does have some Canadian income tax advantages. Business expenses related to home maintenance and home ownership are two common types of business expenses home-based business owners overlook. 6 Home-Based Income Tax Deductions You Don't Want to Miss – While these six Canadian income tax deductions aren’t the only business expenses you may be able to claim if you’re operating a home-based business that qualifies, they're "the best" in terms of reducing the amount of income tax you owe. Calculating the Home-Based Business Tax Deduction explains the rules for claiming the business-use-of-home expense and how to calculate the amount of the deduction if your home-based business is eligible. Capital Cost Allowance – No discussion of Canadian income tax and small businesses would be complete without mentioning Capital Cost Allowance (CCA). Learn how to calculate CCA here and how to make the most of your Capital Cost Allowance Claim here. RRSPs – Registered Retirement Savings Plans are The Best Canadian Income Tax Deduction for Canadian Small Businesses that are structured as sole proprietorships or partnerships. Find out what the RRSP contribution limits are and how to time your RRSP contributions for maximum income tax impact. SR&ED – Many small businesses are under the impression that Research & Development tax incentives are something that only larger or incorporated businesses can use which is not true. The SR&ED Tax Credit Program may apply to your small business too. Gifts to Employees as Canadian Income Tax Deductions – If you're the generous kind of employer who gifts your employees, you'll want to read this piece on the income tax deduction rules for gifting. Your First Business Income Tax Return provides details on how to fill out the T1 Personal income tax return, the Canadian income tax return you need to complete and file if your business is structured as a sole proprietorship or partnership. If you own a corporation doing business in Canada, refer to the Corporate Tax Canada Guide to learn the details of how to prepare and file corporate income tax, including the current corporate tax rates, who can use the T2 Short Return, when corporate income tax is due and more. Top Canadian Tax Software Programs presents what I consider to be the best tax software for small businesses. Most of these can be used to complete T2 ​corporate tax returns as well as T1 personal income tax returns. Questions always come up when you're working on your income tax. These Canadian Income Tax FAQs for Small Businesses provide answers for questions ranging from how having a business that made no money in the relevant tax year affects your business through what to do if you can't pay the Canadian income tax you owe. Many small businesses prefer to have an accountant or other certified tax preparer complete their Canadian income tax returns for them rather than doing them themselves. Expertise and saving time are two obvious reasons, but having a tax professional's "seal" on your small business's Canadian income tax return can also save worry. First things first, if you choose to take this route. Learn How to Find a Good Accountant if your small business doesn't already have one. Just taking a drawer full of assorted documents to your accountant is a really bad (and expensive) idea. Getting Your Tax Records Ready for Your Accountant tells which documents your accountant or another certified tax preparer really needs. The Canadian Corporate Tax Guide is your one-stop tax information page if you operate a corporation in Canada. It provides the details of how to prepare and file corporate income tax, including the current corporate tax rates, who can use the T2 Short Return, when corporate income tax is due and more. Tax-wise, not all Canadian corporations are created equal. Here are the different Types of Corporations in Canada as they relate to Canadian corporate income tax. Top Canadian Tax Software Programs includes Canadian tax software that's capable of helping you complete and file your T2 Corporate Tax Return if you wish to do your own Canadian corporate income tax return. Decreased liability (as compared to a sole proprietorship or partnership) and business tax advantages are two of the most common reasons for choosing the corporate form of business. But is it the right choice for your small business? First, have a read through The Advantages and Disadvantages of Incorporation and see if the advantages outweigh the disadvantages in your case. Then have a look at the Corporate Tax Advantages of the Canadian-Controlled Private Corporation. If you are going to incorporate, this is the type of Canadian corporation you want to have tax-wise. When you have an accountant or other professional income tax preparer complete your Canadian income tax return for you, it's common for him or her to also file your income tax form(s) for you as well. If you are filing your Canadian income tax return yourself, the Canada Revenue Agency offers several different options. Individuals (those filing T1 personal income tax returns) can file their income tax returns electronically by using Netfile if they meet the conditions. (Efile is the version of Netfile used by tax preparation professionals.) Electronic filing is also available for corporations. Individuals can also mail or hand deliver their income tax returns to the appropriate Canada Revenue Agency tax centre. As most corporations already make use of commercial tax processing software, the CRA has implemented mandatory internet filing for corporations with a gross revenue over $1 million (although all corporations are encouraged to file electronically). The only exceptions are insurance companies, some non-resident corporations, and others with unique reporting requirements. 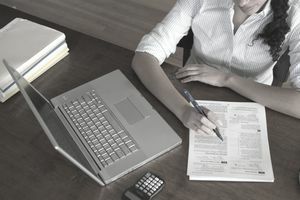 A corporation subject to mandatory internet filing can still send in a paper return; however, the CRA will assess a $1000 filing penalty for additional processing. The CRA offers online accounts to better keep track of your tax information whether your business is incorporated or not. See Canada Revenue Agency Online Accounts for Businesses for more information, including how to register. While most of us consider business record management to be scut work and tend to give it a low priority, good record management not only makes our working lives easier but can give us real stress relief at tax time. Here are 7 Ways to Make Record Keeping Easy. There are legal ways to reduce the amount of Canadian income tax your small business has to pay each tax year, but you have to take action to make that happen. Get started with 8 Tax Strategies to Maximize Your Income Tax Deductions.